Last month, the community of Wales, in Western Alaska, hosted one of the biggest Alaska Native dance festivals in the state. 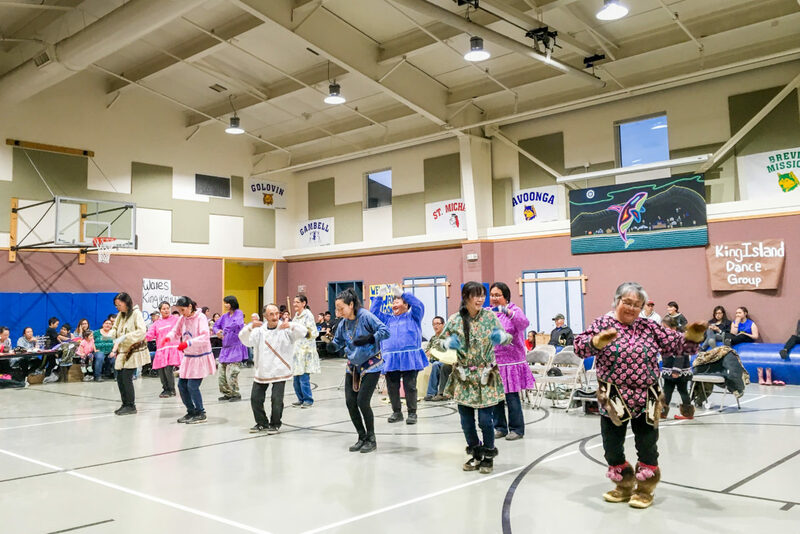 10 groups from around the region and as far as Anchorage flew in to the village over Labor Day weekend, to sing, dance, drum, talk — and heal. It’s 2 a.m. at the western tip of the Seward Peninsula. The Northern Lights dance outside in the starry autumn sky above the community of Wales, and inside the school gymnasium, the Shishmaref Kigiqtaq Dancers show no signs of letting up, either. Edward Tiulana, with the King Island Dancers, said he can feel that when he’s performing. But Tiulana tried to put his feelings into words. Tiulana said in the 1930s, the Bureau of Indian Affairs commissioned a school there but the Lower 48 teachers weren’t cut out for the weather, and the school closed in the 1960s. At that point, families started to move off the island, settling in places around the state. Tiulana used to live on the island. His grandfather, who started the dance group, began teaching him how to drum when he was five. Today, he lives in Anchorage and works as a dance instructor at the Alaska Native Heritage Center. Tiulana said it takes dedication and passion to preserve the tradition. The King Island Dancers is one of the largest groups at the festival, with nearly 15 drummers who fill the gymnasium with thunderous sound. Dancers don traditional head- and arm-pieces and animal masks. One drummer, an older man, closes his eyes, submerged in the song. The group even brings out oars and performs a rowing dance. Beneath the dances, there’s an undercurrent of mourning — for lost homeland like King Island, and lost community members. The festival is dedicated to three elders and three youth who died in the past year: one elder originally from King Island, the other five all from Wales. Samuel Johns is visiting the festival to give a keynote talk on his project, Forget Me Not. It started as a Facebook group that helps homeless Alaskans in Anchorage, who are mostly Alaska Native, connect with family around the state. Johns said his work is very much motivated by that trauma. Johns said doming here gives him hope for the future. Throughout the festival, the younger generation seems energized by the tradition. A young boy from King Island, no older than 4 or 5, dons armpieces and dances with the men. The Wales Kingikmiut Dancers are a young group: maybe half of them are under 25. And in all the groups, children, adults and elders dance together. Among the many who tell me how crucial the mix of ages is, is Annauk Pollock, also known as Denise. It’s her first time at the festival, where she’s dancing with the Anchorage Kingikmiut. She’s originally from Shishmaref, and many of her family there dance and sing. But she grew up between Utqiagvik, Fairbanks and Massachusetts. After time in Washington, D.C., Pollock moved back to Alaska to work with her native town on facing the effects of climate change. Pollock said that includes preserving the dance tradition, which, for her, has become a source of inspiration. One such active young person present at the festival is David Miller. He grew up in Teller and has performed with the Teller and Anchorage groups in the past. Now, he lives in Nome, and this year, he was invited to come to Wales with the King Island Dancers. I asked him why he dances. That sense of duty to both past and future, the weight of history, the grief of losing loved ones. Those could overshadow the simple joys of singing, drumming and dancing. But they don’t. As the golden full moon sets, just off the Cape Prince of Wales, and plunges into the sea, the dance goes on.